How I let this movie slip by me all these years I’ll never know. Spielberg, DiCaprio, Hanks, Walken; powerhouses all and all in one place. And the timing of this film is really something. For Spielberg, it was sandwiched in between complete failures A.I. & The Terminal. For Leo, it marked his last “young” role, moving on next to The Aviator, The Departed, Blood Diamond. For Hanks, it was a last grasp at his 90s fame before a whole slew of bad choices. And for Walken, well he had just done Joe Dirt, was just about to do Man of Fire, so who really knows what’s up with that guy. My point is, Catch Me If You Can has become iconic for its portrayal of a true story and its representation of a decade, but it should also be remembered for the big names that came together to headline the project and for its place in each of their careers. Oh, and for being phenomenal, that too. 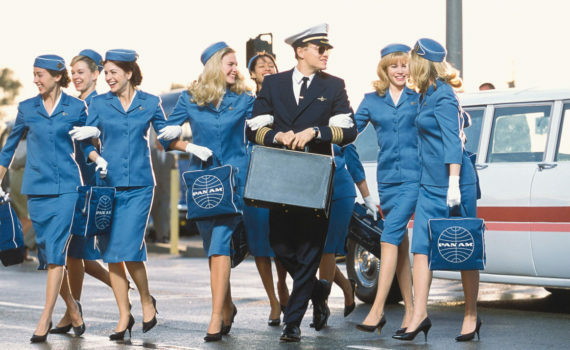 This is the can’t-believe-it’s-real story of Frank Abagnale Jr. and his life of crime. Living in New York in the 60s, teenage Frank quickly learns that money talks. His father loses his business to the IRS, even while scheming to keep his head above water. Frank picks up the subtle art of the con from his dad, but takes it to new levels when his parents divorce, moving to the big city and trying to make it on his own. Frank begins forging checks, cashing phony pay stubs, defrauding banks. But he’s no mere criminal, he’s also a master of deception. Frank poses as an airline pilot, a doctor, a lawyer, all with the ease of putting on a suit, and all while being just a kid. His youth won’t keep him out of trouble though, as agent Carl Hanratty of the FBI is hot on his heels, making it his life’s work to hunt down this multi-million dollar thief, this con artist of the century. It’s incredible that this story is true, especially when you get to the end & can look back on all Frank pulled off, all while under the age of 19. What he does with his life after that is also pretty exceptional, but this story solely focuses on a period of about 3 years. Credit Spielberg for finding this gem of a plot, molding it into his style, and delivering one of the coolest crime dramas you will ever see. It helped that he had this amazing cast, all who were hovering around their prime, and that’s not even taking into account the side actors who make appearances in this movie: Martin Sheen, Amy Adams, James Brolin, Jennifer Garner, Ellen Pompeo, Elizabeth Banks. It’s stunning that I haven’t seen this film before, and I’m so very glad that I’ve seen it now. Often set during Christmas, this is now on my list as a must-watch around the holidays, not only for its parts but for its entertainment as a whole. I’m not sure what else you could ask for from a movie; music, laughs, anticipation, storytelling, characters, a time capsule approach, action throughout that always delivers perfect pace. Catch Me If You Can is more fun than it is art, but don’t discredit the work this team put in to make this film something that you love to view every single minute and could probably turn around to watch almost immediately. I can’t gush any more; I loved this movie.